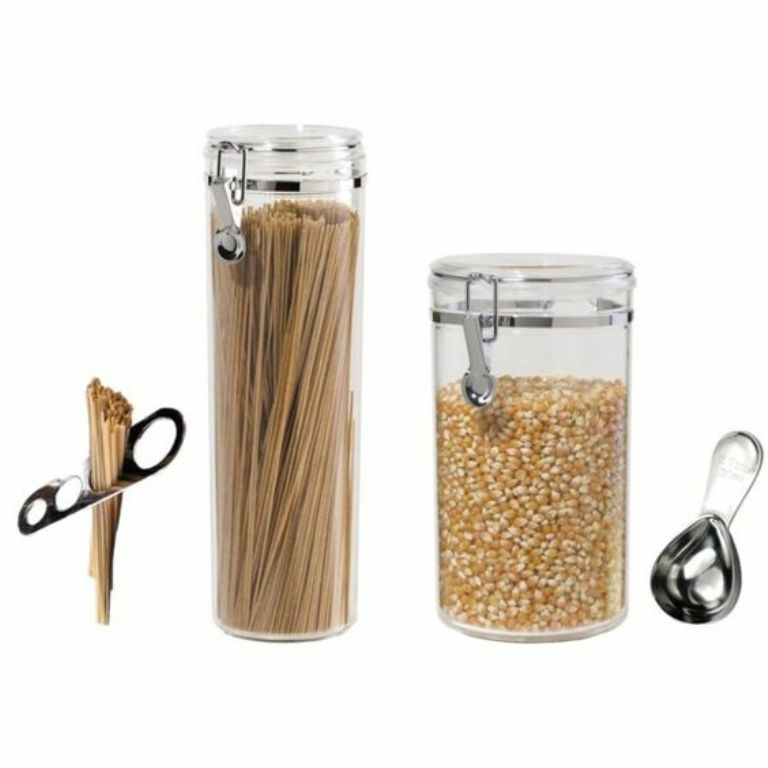 Store snacks, tea, flour, sugar, pasta, popcorn and more in these acrylic canisters by Oggi. Flip top locking lids with a silicone gasket that seals airtight-keeps your food fresh longer. Made from BPA-free material. Make the perfect proportions for your next spaghetti meal using this spaghetti measurer. The stainless steel measure has four different measuring holes to identify the correct amount of spaghetti for 1-4 servings. Fitting into small canisters and jars, the two tablespoon scoop is perfect for scooping popcorn or other kitchen food staples. Oggi Acrylic Canisters with tinted flip-top lids and locking clamps with silicone gaskets are airtight and great for storing snacks, tea, flour, sugar, pasta and more. The Spaghetti Canister measures 12 inches by 4 inches and has a 58 oz capacity. The Popcorn Canister measures 9 inches by 5 inches and has a 65 oz capacity. A Stainless Steel 2 tablespoon Scoop is included and fits perfectly in the Canister and works great for scooping popcorn or other staples. It is made from 18/8 stainless steel and is 4 inches long with a 2 tablespoon capacity. Make the perfect proportions for your next spaghetti meal using this spaghetti measurer. The stainless steel spaghetti measure has four different measuring holes to identify the correct amount of spaghetti for 1-4 servings.